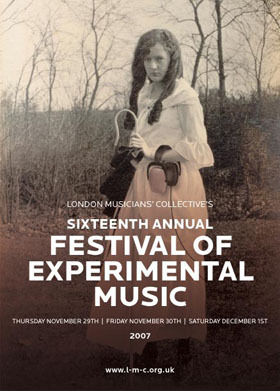 LMC’s 16th Annual Festival of Experimental Music :: Cochrane Theatre, Southampton Row, London WC1B 4AP :: November 29 thru December 1, 2007 :: Tickets: 02072691606 :: Festival Pass: £35/ LMC Members £20 :: Day Pass: £15 / LMC Members£10 / Students £5. International in its sweep, uncompromising in its substance – Time Out :: Two dozen performers from around the world are given free reign to redefine music. Over three days they coax incredible sounds from all manner of instruments, in every conceivable way. Performers include: The elder statesman of Japanese sound-art Yasunao Tone; mesmeric minimalist legend Charlemagne Palestine; and Norbert Möslang, enigmatic torturer of household electrical goods. Group improvisations feature: Tony Buck, superlative drummer of Australia’s best export, The Necks; brilliant Belgian string virtuoso Julia Eckhardt; and sensational American trumpeter Peter Evans. And to surprise ourselves, Taku Sugimoto, whose guitar playing is so restrained as to stretch the laws of time; Bob Levene, who uses turntables as audio sculpture; and Helena Gough, who reveals the laptop as a landscape teeming with twittering life.